Bible studies are a primary and often the best way to introduce someone to knowledge of the Lord. Though it is true that only the Holy Spirit can bring a person to repentance and salvation, it is also true that the scriptures are inspired by God and useful to teach us what is true and to make us realize what is wrong in our lives. They correct us when we are wrong and teach us to do what is right. Though it is also true that the Bible does not save us. It is one of the best ways to lead a person into enough knowledge about the Lord so that they wish to know the Lord Jesus personally. Jesus saves—only Jesus. But He also anointed the writers of the Bible to give us the truth about creation, humanity, and divinity. This book shares nearly forty years of experience in leading Bible studies to you. It shows you how to proceed so that the Holy Spirit can actually lead your Bible study. This is the only way you can actually be used to transform people’s lives. We have no power in ourselves except for the power of God which lives in us. You need to learn to tap that power—allowing it to flow through you to touch people and transform their lives. The power is in the Lord. 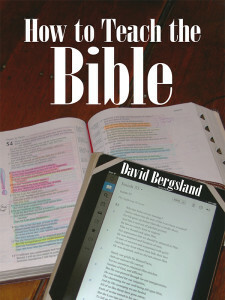 This book has tips and techniques from a man who has been focused on teaching scripture for almost 40 years. This is not some wimpy guide, but practical instuction on how to allow the Holy Spirit to transform your Bible study into a tool to help your students grow spiritually beyond what they ever expected. These techniques will change lives [including yours as the teacher].